I tell the prehistory. In fact, I bought a sweet potato accidentally. I was looking for a pumpkin, but as it turned out, we get the sweet potato was easier :) And as I remembered (and reading), that it resembles a baked pumpkin, I decided to buy and make sure! And, without thinking twice, I decided that I definitely prepare flan sweet potato. Why flan? Again, from somewhere in the bowels of the memory surfaced that its preparation often use fruit puree. A sweet potato puree is a surprisingly gentle and sweet (as if sugar), as well as any fruit! By the way, a few words about yourself dessert (in its classical performance). 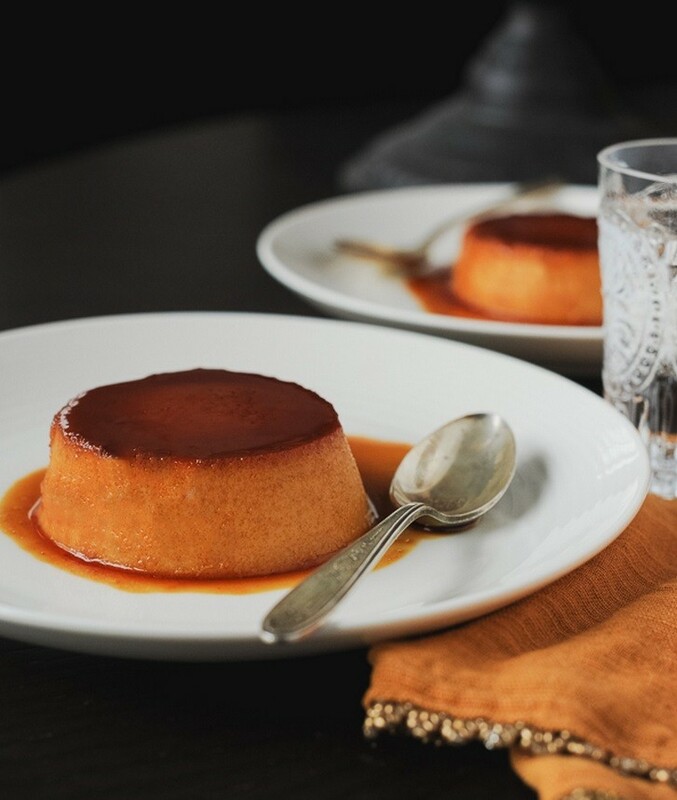 Flan - one of the favorite and popular delicacies in the Spanish and French cuisine. At dessert is quite a long story, and during that time there were dozens of options for a prescription. Cooking can be really quite different: to do sweet or salty, with the flour / starch or without, with various fruit "fillings", chocolate and so on. The basic principle is as follows: first to the bottom of a shallow mold is filled candy (this is not required, but is most often the case), and on top - a mixture of eggs (mostly yolks), cream and, if desired, fruit puree. And then everything is baked on water bath until tender. By the way, if you happen to buy sweet potatoes, no problem can cook flan with pumpkin on the same prescription, retaining all proportions. I'm sure the result will not be worse! 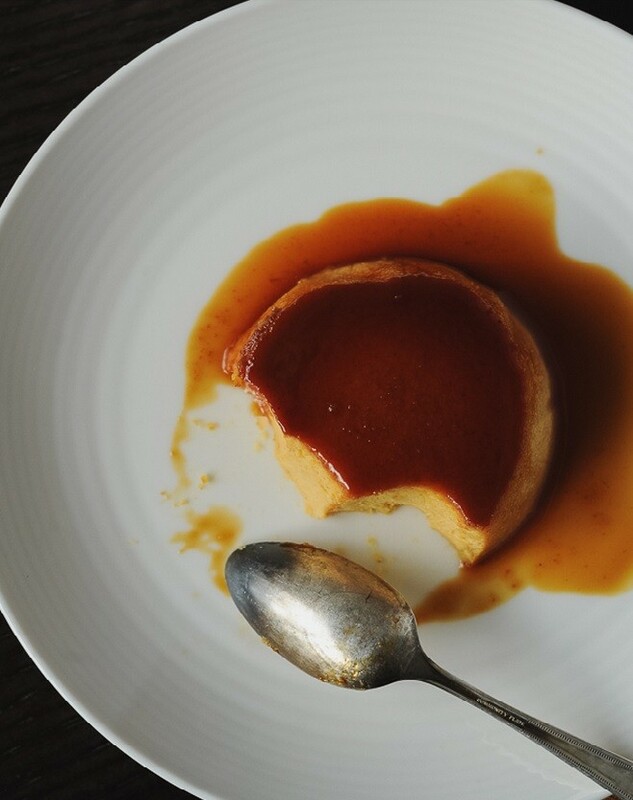 You can prepare a diet version of flan, without caramel. At your discretion. *Can be replaced by mashed sweet pumpkin. **You can replace the conventional cream 10% -20%. Prepare the mashed sweet potato (or pumpkin): Cut into slices and bake in the oven for about 40-50 minutes (required covering the top with foil). Once milled to homogeneity using blednera. For a water bath: High in the pan to pour hot water (at ½ the height of the wall) and put in a preheated 170 degree oven. To prepare the caramel: Pour the sugar in a saucepan, add a couple tablespoons of water, heat over medium heat, stirring until sugar is dissolved. Following up the heat and boil for a minute 3-5, not stirring (fundamentally! ), And tilting the skillet and wiping with a damp wall brush cooking. When the syrup begins to acquire the amber color, quickly pour it on Forms (I had 3) thin layer, helping a silicone spatula, or put on the bottom with a brush. This should be done very quickly, caramel hardens instantly! Molds aside, they are not needed. Egg yolks and whisk a few minutes before the pomp and sugar (if using stevia / syrup, then add them at this stage of the eggs is not necessary, add a pinch of salt). Add the egg mixture to the mashed sweet potato parts (beating on low speed), coconut milk, stevia / syrups. Milk is heated in a skillet (it can be in the same place where the caramel) until the bubble (but do not boil!). Carefully pour a thin stream of hot milk to the main mixture, beating at low speed. Optionally, add the vanilla, cinnamon. Pour the whole mass back into the saucepan and heat for a minute over medium heat, stirring occasionally. Pour into molds. Put them on a baking sheet with water. Molds need to dive into the water by half. Bake the flan sweet potato 60-70 170 minutes at degrees. Then turn off the oven. Allow to stand in the forms it has 30 minutes and then remove. Cool completely and put into the refrigerator for a few hours, and ideally - for the night. Serve the flan of sweet potatoes need only cold (swipe with a knife along the rim shape, and then lower it to 10-15 seconds in hot water and invert on a plate). Now you know what to cook unusual sweet potato (or pumpkin), surprising friends and offers a sophisticated supply!